This is a new painting I recently finished. I’m very excited about this particular painting. It is the second in a series of paintings where my art takes a huge turn. The first painting is Dripping Down which I previously blogged. There are three more in addition to this one. As I mentioned in my earlier post, I purchased a new digital painting app called Rebelle, by Escape Motions. This new app allows me to do things I’ve wanted to do this in my paintings forever. It makes these fabulous drips. It has watercolors, inks and acrylics that I’ve used to start my paintings. Then, I bring them into Painter and finish them up with oil brushes. I am having so much fun. The way I paint completely lends itself to drips and running water media. I start my paintings by making marks of all kinds on the first layer. Then, I keep refining the marks and adding more objects/marks until a painting or specific objects start to emerge. This is called intuitive painting. At the moment, it is a very popular way to paint. 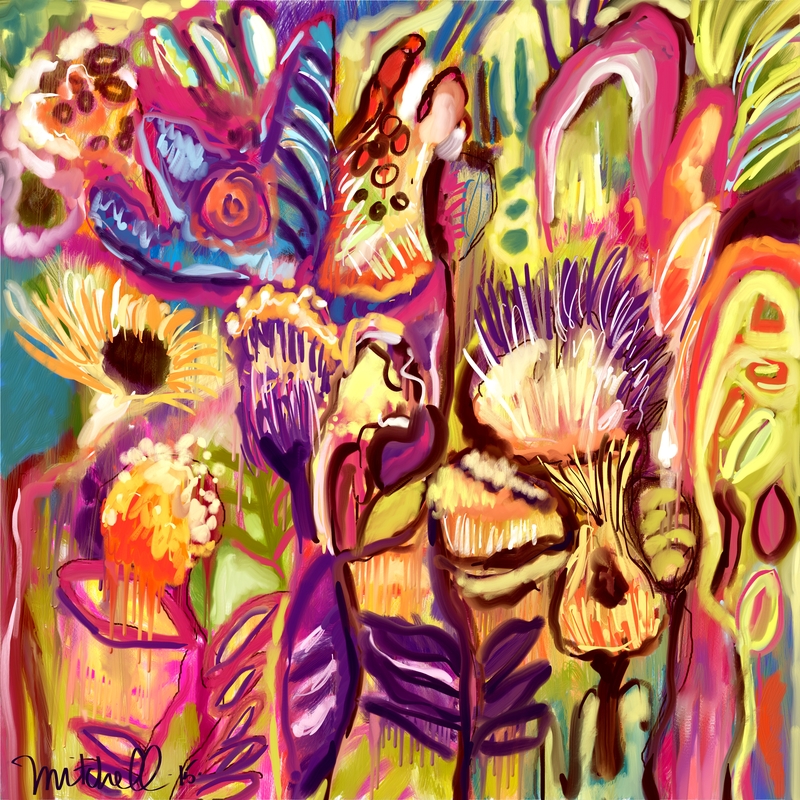 Flora Bowley and Tracy Verdugo, whom I have taken classes from, both teach on-line classes in intuitive painting. Along with their art classes, they both teach a philosophy of living in a positive and joyous way. Flora even has people doing yoga poses as part of her classes. I find this a great way to paint, and it lends itself well to digital media. When I took the first course from Flora, she used drips a lot. I loved the effect she got from them. I have tried to get this running effect ever since. Now, I have it. It has completely changed how I paint. I feel I finally am developing a style that is uniquely my own, and one that others are enjoying. Stay tuned in for the next few paintings, and you’ll see what I mean. I like the feel to this piece Kerry – great energy. Thank you so much, Mary. I’m finally getting where I want to be with my art. A very big deal Kerry, loved reading this. This latest piece really showed well. Thanks. I’ve got more pieces that I like and need to blog. You are developing a very bold style, keep it up. Thank you so much, Carlos. You are one cool dude! Thanks so much for commenting. I had so much fun painting this. Just wait until my next few blogs. This painting has taken me down a wonderful path.